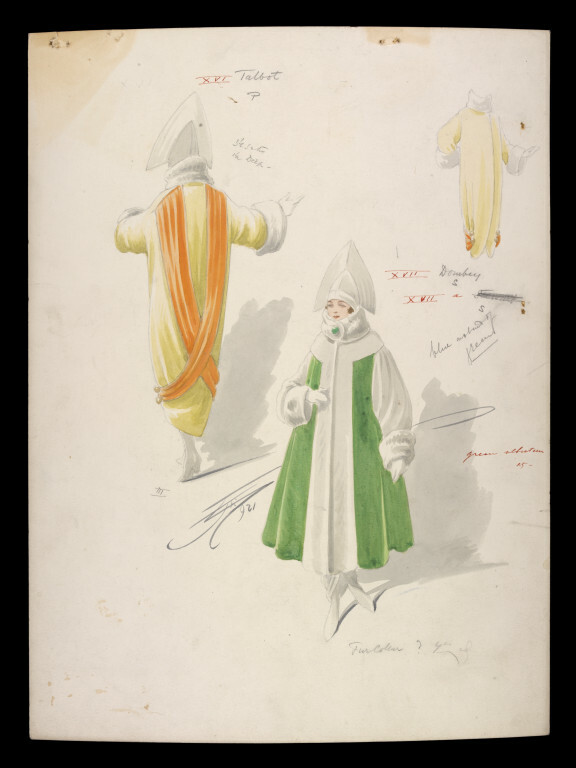 Costume design by Attilio Comelli for Two Chorus Ladies in Sybil at Daly's Theatre premiered on 19 February 1921, Emile Littler Archive. This production of Sybil is a musical play in three acts undert he direction of Robert Evett. Book by Harry Graham, music by Victor Jacobi and production by Seymour Hicks. The musical director was Merlin Morgan, stage director was Fred J. Blackman and the dances were arranged by Fred Farren. According to the cast list the gowns, cloaks and furs worn by Miss Collins were designed by Mr. Reville and executed by Reville Ltd., on 16 Hanover Square, W. Misses Beatty and Stirling's designed and executed by Madame Esther. 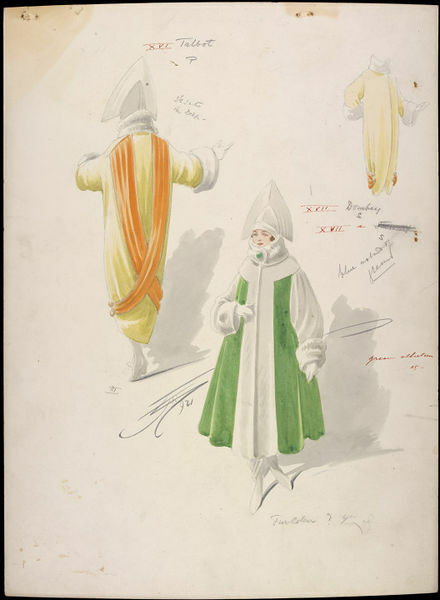 Other costumes were designed by Comelli and executed by Miss Mary Fisher, Myra Salter and John Simmons & Sons. Uniforms by Morris Angel & Son, Ltd. Boots and shoes by H. & M. Rayne. Wigs by Clarkson. Properties by J. A. Fraser and Meurice. 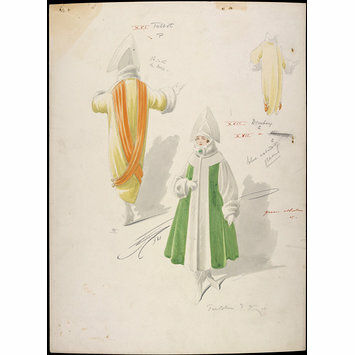 Costume design by Attilio Comelli for a two Chorus Ladies in Sybil at Daly's Theatre premiered on 19 February 1921. Two female figures in outfit, the one in the left in yellow and orange colours, and the one on the right in green and white. Both with white headdress with pointy top. A smaller drawing of the front side of the yellow outfit was drawn on the upper right hand corner. Dated and signed. Drawn on millboard. Label from manufacturer printed in black ink, with an illustration and address: C. Roberson & Co. Ltd. 99 Long Acre & 155 Picadilly London. Two sets of marks on the top of millboard.